Is your K-12 school district struggling to maintain a reliable network infrastructure that keeps up with the demands of today’s EdTech-rich curriculum? 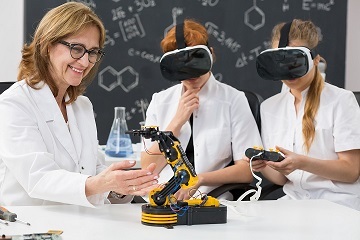 School and campus networks are facing challenges to support enhanced classroom video, virtual reality, online collaborative tools, Internet of Things devices, and a growing range of digital media. Help is available! Our Connected Classroom Planning Kit has the resources you need to ensure your network will meet the demands of all emerging instructional technologies. The 802.11ac Wi-Fi Buyer’s Guide provides the information you want to know about 802.11ac and will help you in your decision to upgrade. The Bring Your Own Device solution brief lays out the benefits and critical technology issues your network will require to overcome for a successful BYOD initiative. Our IoT solution guide and Smart Buildings eBook convey insights into the growing presence of the Internet of Things and how it can impact your school’s network. They provide guidance to help your school benefit from IoT sensors and devices. New EdTech trends such as cameras in the classroom, virtual reality, augmented reality, artificial intelligence, and others are explained in our Making the Case for Security Cameras in Schools white paper, 8 Technologies and Trends to Inspire Creativity and Enhance Teaching slide share, Video Cameras in the Classroom infographic, and Virtual Reality Surging Into the Classroom infographic resources. Successfully navigating the e-Rate process is vital to k-12 education in the US. Our Essential Guide to E-Rate Success is an excellent resource for schools applying for e-Rate funds. Our blog on the availability of e-Rate funding offers tips for schools starting and navigating the process from McMinn County School System. Besides this planning kit, another valuable resource for e-Rate is Extreme’s E-Rate Resource Center. Access the Ultimate Connected Classroom Planning Kit now.